A Mesa, Arizona building owned by Apple, Inc. Caught fire today. The fire is reportedly out, according to multiple source, but you can still see the smoldering building and firefighters working the scene in images from the likes of NBC 12. The building looks suspiciously like the building that was subject to some Apple news earlier this year. Back in February, Apple announced it would be investing $2 billion over 10 years to turn a Mesa facility into a data center. The building is a former GT Technologies building. Last year, a deal between Apple and GT to build a sapphire manufacturing operation in the area failed when GT went bankrupt. Solar panels on the roof of the Mesa building caught fire today and according to reports, nobody was hurt in the incident. You’ll recall that Apple has made light of its use of renewable energy at data centers in the past. 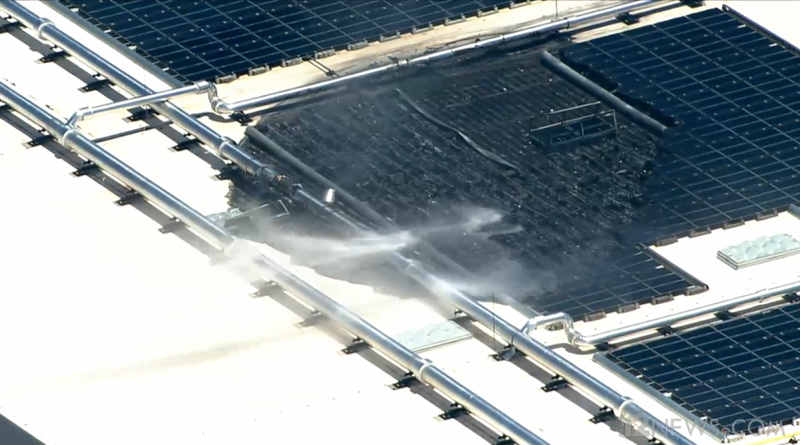 It’s not clear at this time if anything about the solar panels is to blame for this fire. According to NBC 12, a dozen people were evacuated from the facility, and it took 35 minutes to put out the flames.